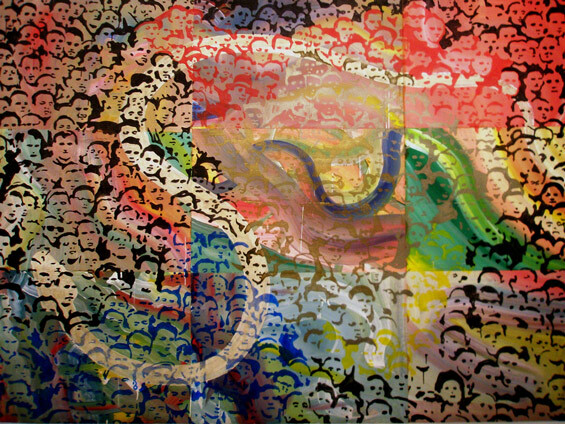 http://charlotteskitchendiary.com/wangzhan.zip Sigmar Polke’s Human Snake is a painting of a faces in a crowd. The transparent lattice of conjoined faces provided his use of tonal dropout reveals large fluid snake-like gestures and forms writhing below the social gathering. He combines his artwork with his engagement with activism and social movements as well as Buy Alprazolam Online Uk his work with animal energies and supernormal forces. The snake forms represent the telepathic umbilical cord that Tarde observes within crowds, and the aspect of crowd contagion as it is anchored in a part of the parasympathetic brain function that is shared with reptiles.